Leading Manufacturer of stainless steel erw pipes from Umbergaon. 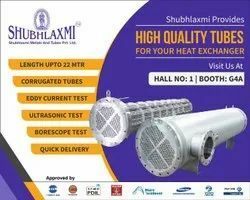 Shubhlaxmi Metals and Tubes Pvt ltd is one of the major manufacturers of Welded Stainless Steel ERW Pipes for application in Power generation - Nuclear, Thermal and Solar, Refinery and Petrochemical, Oil and Gas, Chemical and Fertilizer and Process Industries etc. We manufactures Austenitic, Super Austenitic, Duplex and Super Duplex welded stainless steel pipes both from coil and plate. The weld procedures used are TIG, Combination of Plasma and TIG ,TIG with filler, TIG and SAW, SAW depending up on the wall thickness of input raw material for Pipe manufacturing. A complete range of testing facility in-house contributes to consistent quality control. With good investment in modern forming welding techniques, Shubhlaxmi Metals and Tubes Pvt ltd is able to meet the most stringent market demands in terms of quality and delivery.